Research has made it clear: Breast milk rocks. At Sky Ridge Medical Center, which has made great strides in boosting breastfeeding for the long-term health of its littlest patients, a new endeavor to secure a “Baby Friendly” designation will ensure more of the nearly 4,000 babies delivered each year reap the rewards of their mother’s milk. But the national initiative does more than recognize hospitals for their breastfeeding efforts. Its required changes enhance the birthing experience for all parents and babies by boosting family bonding and parent education, says Tamera Martin, manager of Sky Ridge’s pediatric department and Neonatal Intensive Care Unit. “It’s one part of a bigger effort to improve overall care,” Martin says. 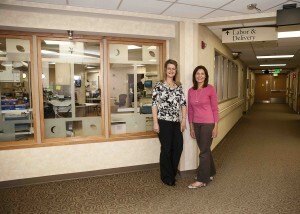 Tamera Martin, pediatric department manager (left) and Beverly Wilhelm, lactation consultant, (right) help make Sky Ridge Medical Center a “Baby Friendly” place. “Baby Friendly” requires all babies, when medically possible, be placed on Mom’s chest right after birth for the first hour, which has a number of researched benefits. “Studies have found that babies who nurse in the first hour of life have fewer breastfeeding issues later on,” says Beverly Wilhelm, a Sky Ridge lactation consultant. By encouraging that skin-to-skin time during that “golden hour,” newborns will instinctively root for the breast and begin feeding, Wilhelm says. “And it’s not just about breastfeeding,” Martin says. That first hour is special for parents and promotes family bonding, she says. Research also shows a mother’s body next to baby’s helps regulate the newborn’s temperature and stabilize vitals faster, Martin says. The initiative also requires staff to encourage “rooming in,” where babies remain with their parents during the hospital stay, rather than spending hours in the nursery. “With rooming in, breastfeeding unfolds more naturally,” Wilhelm says. Babies are more likely to feed on demand, which builds breastfeeding skills and milk supply, she says.